Place cookies (cream and all) into the bowl of a food processor. Process until finely crushed. If you don’t have a food processor, place the oreos in a large ziploc bag and crush using a rolling pin until the oreos have a fine consistency. Retain 1/2 cup of crumbs for filling. In a medium bowl, add the remaining crushed oreos and the melted butter. Mix until well combined. Press the mixture into the bottom of a 9-inch pie dish. Place the dish in the freezer for about 10 to 15 minutes. Meanwhile, in a large bowl, whisk together the sweetened condensed milk, peanut butter and vanilla extract. Set aside. In the bowl of a stand mixer fitted with the whisk attachment, add the heavy cream. Whip on high speed until stiff peaks forms, about 3 to 5 minutes. Add the whipped cream to the bowl with the condensed milk. Gently fold together. Coarsely chop 15 peanut butter cups. Remove the pie dish from the freezer. Add half of the cream mixture to the pie shell. Heat the hot fudge sauce in the microwave for a few seconds so that it will pour easily. 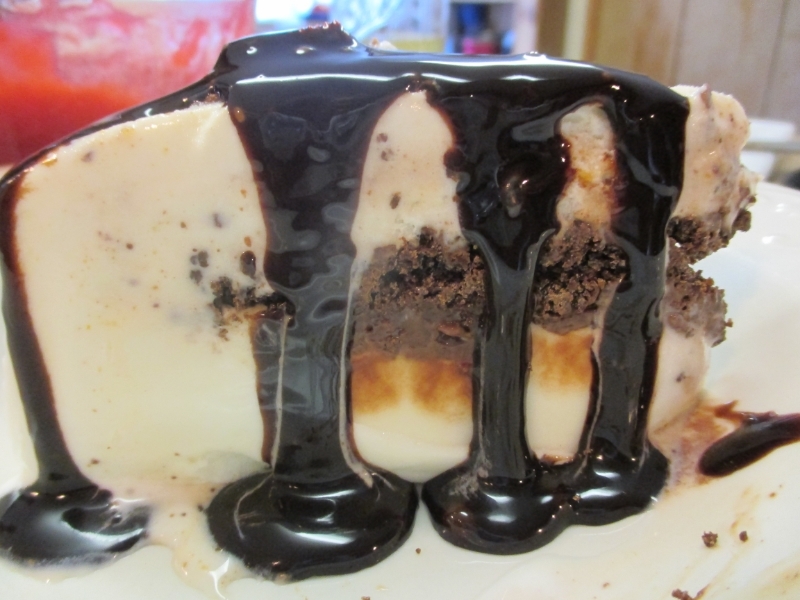 Drizzle half of the hot fudge evenly over the pie. Top with retained 1/2 cup of Oreo crumbs, chopped peanut butter cups, then the remaining half of the cream mixture. Cut enough peanut butter cups in half to use as decoration on top of pie if you wish. They will cut more easily if you freeze them first. Return the pie to the freezer for at least 6 to 8 hours before serving. Once everything is set, I usually cover loosely with aluminum foil. Drizzle with additional hot fudge sauce when ready to serve.